Rent a large self-catering apartment in Paris or hire a big holiday house in the Ile-de-France for a group holiday in the heart of the country. For an outdoor adventure, stay at a big chateau activity centre which caters for large groups, offering on-site activities such as abseiling, archery, swimming, football and boules. Enjoy world-class architecture and sightseeing in Paris, visiting famous landmarks such as the Eiffel Tower, Arc de Triomphe, Notre Dame Cathedral, Louvre Museum and the atmospheric Montmartre area. 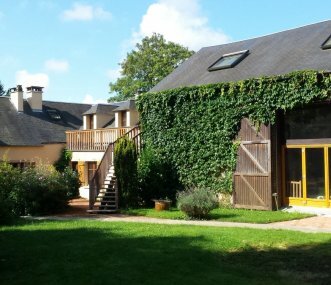 19th century farm barn spectacularly renovated and decorated by its French owners, now comprising 2 joined lodgings with swimming pool, tennis and plenty of other facilities. Sleeps up to 30.